A revealing look at the issues and controversies of grassroots level hockey, including everything from children developing life skills to the thrill of playing for the love of the game to high financial obligations, the dangers of hazing rituals, "crazy" hockey parents, and the sometimes too-strong desire for kids to play in the NHL. It features one Saskatchewan hockey family's experience, and the growth that the father undergoes as he learns from his mistakes from being a too-involved hockey parent to understanding that hockey is a game that should be enjoyed not pursued as a career by pre-teen children, a message that parents of all athletes can understand. This fictional account is an interesting take on minor hockey and minor sports in general. Every parent is guilty, to some degree, of taking their child's athletics too seriously. Some are involved way too much, others lapse in the heat of a big play. So most adults will likely find a little of themselves in this book. Hopefully just enough to remind them of what really is important in kids sports - that the kids are having fun, not that they make it to the big leagues. Here is an in-depth interview with author Louise Waronek courtesy "Down From The Peak." 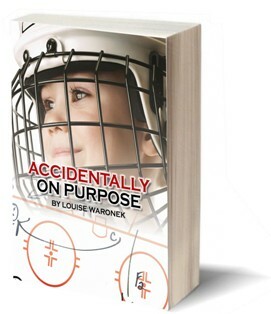 To purchase your copy of Accidentally on Purpose, contact Louise Waronek by phone at (306) 584-9706 or by email at l.waronek@sasktel.net.